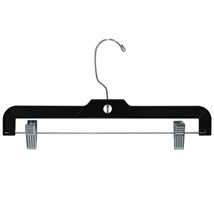 Sturdy black plastic clothes hangers have chrome metal swivel hooks, hang bars and padded clips. Top quality construction that will last for years. Hooks designed to hold size hanger markers, sold separately. Search size markers for our complete selection.